Over the years, a “tune-up” has meant different things, but the basics of how a gasoline engine works haven’t changed. Clean gas and air need to be driven to your vehicle’s cylinders. That’s where combustion, initiated by a spark plug, creates the power to move your vehicle. 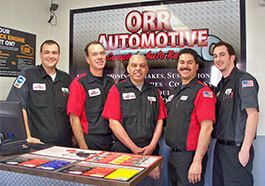 Orr Automotive's standard tune-up includes a spark plug replacement to revitalize your engine. Getting tune-ups in line with your manufacturer’s recommendations makes your engine easier to start, improves fuel economy, lowers emissions and restores lost power.